The Jawahar Navodaya Vidyalaya, run by Navodaya Vidyalaya Samiti, New Delhi, an autonomous organization under the Department of School Education and Literacy, Ministry of Human Resource Development, Government of India. 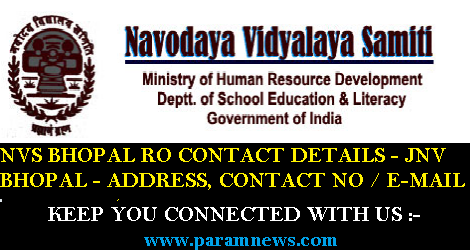 NVS BHOPAL RO CONTACT DETAILS - JNV BHOPAL - ADDRESS, CONTACT NO / E-MAIL The Jawahar Navodaya Vidyalaya, run by Navodaya Vidyalaya Samiti, New Delhi, an autonomous organization under the Department of School Education and Literacy, Ministry of Human Resource Development, Government of India. JNVs are fully residential and co-educational schools affiliated to Central Board of Secondary Education (CBSE), New Delhi, with classes from VI to XII standard.